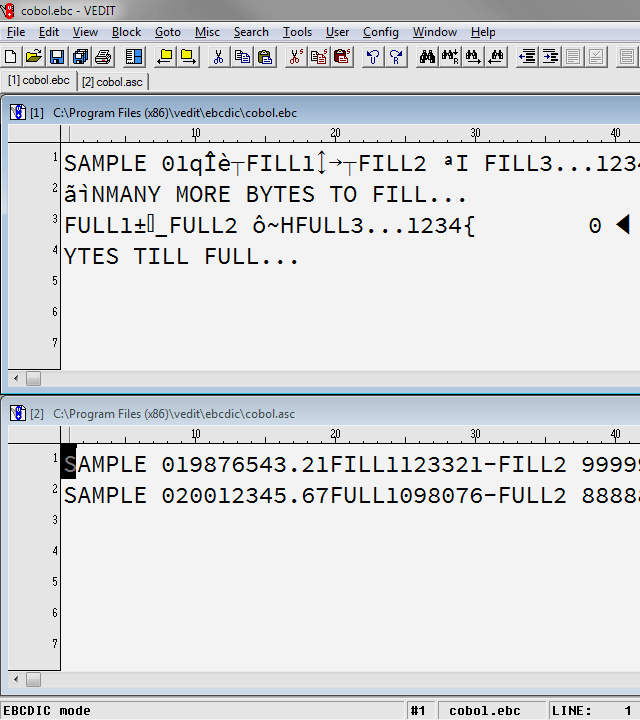 View and edit EBCDIC data files and convert them to other formats, like binary (hex) or ASCII. vEdit EBCDIC packages handle packed, signed, binary, floating-point and other special fields; fixed-length or variable-length records and more. Try the EBCDIC Converter Free! You can edit an EBCDIC file using vEdit's "EBCDIC mode", which lets you see the actual EBCDIC characters. This is done when the file will be transferred back to a mainframe computer. It avoids problems associated with translating from EBCDIC to ASCII and back to EBCDIC again, because there is not a one-to-one correspondence between characters EBCDIC and ASCII characters. Convert EBCDIC For Database Import via ASCII, CSV, etc. When you need to convert (or translate) EBCDIC data to ASCII (e.g., for importing it to a relational database, like mySQL, SQL Server, or MS Access), you can first open the file and any Copybook in vEdit. You make any changes that might be necessary and then do the conversion. Huge 100+ megabyte files can be translated; even files over 10 Gigabytes. The translation is controlled by an easy-to-create data layout file which specifies the packed field locations. You can cut & paste the COBOL "copybook" into the data layout file. If you have multiple files to convert, you can automate the entire process via a Windows icon, a command line or batch file. Our EBCDIC conversion packages can translate almost any EBCDIC (COBOL) file with packed (signed), binary, zoned or other special fields. Several vEdit EBCDIC packages are available, depending upon the complexity of your EBCDIC files. Can translate EBCDIC files with any number of packed (signed) decimal, binary or zoned fields. Try it Free! All the Level II functionality, plus it can translate multiple record types with different field specs / REDEFINE clauses. We can make a custom turnkey solution for you to run yourself or we can do the whole conversion for you! If your files are on tape, we can even transfer them to disk in our secure off-line facility.